We hope that everyone is healthy. With all of the talk of the terrible flu that is going around, it is scary. Had our flu shots, but still had something – a really bad cold and the stomach flu twice!!! As we were having a coughing sing fest one night and madly using tissues to contain very drippy noses and whatever else. We were thinking about our poor ancestors that didn’t have disposable tissues? They used handkerchiefs and spittoons. Whenever someone talks about spittoons, they always mention chewing tobacco. People that “chew” do use containers many times, even today they use spittoons, cans or the ground to get rid of their waste. But there was a whole array of diseases that people acquired that also used spittoons such as colds, pneumonia, “consumption – covered a lot of diseases that people didn’t have names for”, TB, etc. A spittoon needs a flange or a large “lip” to direct the waste product into the base which holds the waste until it is ready to be cleaned. It must be easily cleaned in the base part so that the waste can be disposed. The container must be heavy so that it is not easily tipped over spilling the contents. That is a very easy way to tell reproductions from the old spittoons. There are a lot of new brass spittoons on the market and they are very easy to knock over. In carnival and in stretch glass, we have very small spittoons that only dolls could use, but are called “Lady’s Spittoons”. Most of these we would consider more as whimsy pieces than usable spittoons even for ladies of wealth! Plus they would be easy to carry out from the glass factory without any fanfare. Since this is Stretch Tuesday, we would like to show a couple of stretch glass spittoons. The Fenton spittoon comes in Velva rose as well as the celeste blue. Fenton also made a spittoon about the same size and weight as the above one only with an octagon top. Have seen it in the catalog, but haven’t seen one in person. The spittoon on the right has the embossed circle on the base that is why we thought that it might be Northwood. It is the only one we have ever seen with the cutting on the rim or even without the rim design. Both spittoons are heavy and they would probably remain standing in a 7+ earthquake. Actually both did! They didn’t have any fluid in them so am not sure if a full bowl would have splashed out! The Concave Diamond is the same mold as the bedroom pitcher. Imperial shaped spittoons since spittoons are popular, every vase that half way looks like a spittoon shape is called a spittoon! We thought that you might like to see some different metal and wood spittoons with most of these from the 1870’s to 1900. Just as the stretch and carnival glass spittoons are rare, the following spittoons are even rarer. Of course, like the glass spittoons many more were made, but have been lost during the years. The waste pans on many of these are made of metal. The waste products are very acid and quite readily eat away the metal. So some of the waste pans are even harder to find than the spittoons! 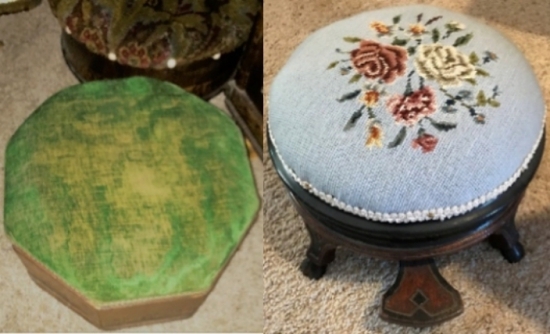 Footstool spittoons from fancy hotels. The stools were covered in rawhide and many others in velvet. Inside one of the spittoons is a painted picture. 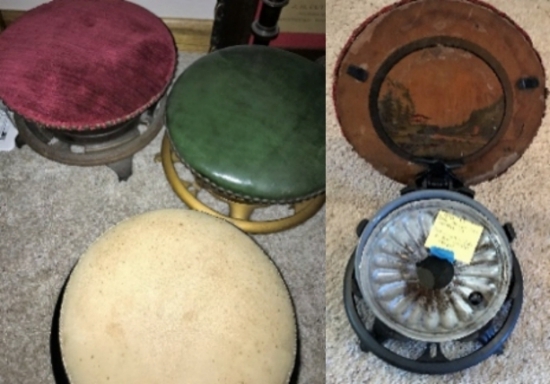 The round metal circle that you see in both pictures is what you would push with your foot to open the spittoon so you could use it. Hopefully our forefather’s had a better aim that we would! 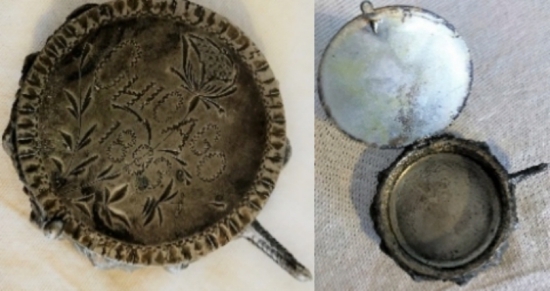 The embossed metal covering (with the yellow posty note telling the Provence of this spittoon) in the second picture is removable so you could clean the metal waste container that is underneath as well as the metal portion on top. These spittoons are made out of wood with ceramic inserts. 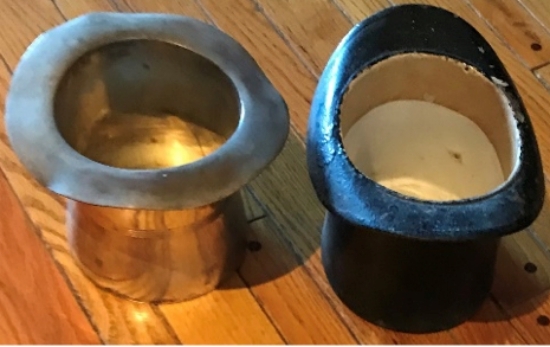 The spittoons on the left are manually operated (you open the lid yourself) whereas the one on the right has a foot leveler to open. Turtle spittoons were very popular. We have four varieties of turtles. The first turtle on your left is advertising a store. He also has holes drilled in his feet so he can’t crawl off. All of these have metal waste pans. You step on the turtle heads to have them open. They made spittoons in the shape of top hats. The one the left is brass. The one on the right is a size 7 with a porcelain interior and very heavy. Postage was as much as the spittoon! A metal clown on the left. You step on his foot to raise the lid. A metal crab on the right. Step on the front large claw to open. He has green glass eyes. Both have metal waste containers on the inside. 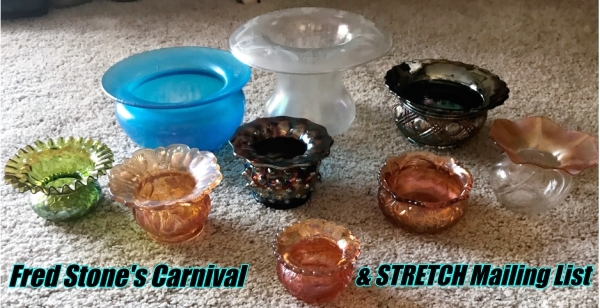 Spittoons in stretch glass as well as the ones in carnival glass could easily be called rare or at least rarely seen. Also there are many pieces of glass that can easily be referred to “spittoon” shapes even though they are not spittoons. Many spittoons were called “Sweet Pea” vases. Tried putting Sweet Pea flowers in the vases and by the second day the sweet peas were falling over the side! Hope you enjoyed seeing a variety of different types of spittoons. Our forefathers certainly had a good sense of humor! Even though spittoons held smelly unsanitary waste products they do have a place in our history. Many people interchange the words spittoons and the cuspidors. Cuspidors are a fancier name for spittoons. Now if you ask Russell’s father what is the worst job in the world, he would say hands down and we agree, that cleaning the spittoons in his father’s barber shop was the worst job ever!!! What spittoons do you have in stretch glass that we haven’t shown or maybe another color that we haven’t talked about? Please let us know as that is the way we learn.